"The Elder Scrolls told of their return. Their defeat was merely a delay... 'til the time after Oblivion opened, when the sons of Skyrim would spill their own blood. But no one wanted to believe... believe they even existed. And when the truth finally dawns... It dawns in fire!" The dragons are here and proceed to carve out a place for themselves in the setting, waging war on the other species. The dragons' return is imminent and one camp aims to assist it, while the other prepares to fight them and their supporters. The returning dragons are non-sentient and one faction tries to control them and conquer all the others. The dragons are benevolent and return because a conflict is afoot that requires their near-divine intervention. The dragons' return is just the first, symbolic portent of other calamities that are about to befall the world. Also included are mythical species that occupy similar position in their respective settings' supernatural food chain (e.g. some types of gryphons). If they are present, a conspicuous absence of actual dragons in the setting may be expected. Contrast Last of His Kind (a single specimen is more of an oddity than an existential threat to other species). Subtrope of The Magic Comes Back and Not So Extinct. May or may not involve Fossil Revival. Fairy Tail has this as a very important part of the Time Travel plot in the Grand Magic Games and to some degree the Myth Arc of the whole series. 400 years ago, dragons ruled the world and saw humans as food or pests, but one day, humans learned to fight against them and even defeat them. Dragons became more rare and reclusive, and humans became the dominating species. However, dragons were still known to exist until July 7th 14 years ago (7 years ago pre-Time Skip) when they for unknown reasons disappeared completely (though they still reside in some place inaccessible or not discovered by humans). Back to the time travel: In order to defeat the evilest dark wizard of all time, Zeref, the Kingdom of Fiore wants to go 400 years back in time, via a special gate to the past, and kill Zeref when he originally appeared. Unfortunately, when they open the gate, some dragons appear and wander into the present. Thanks to the complexity of time travel, at least three different timelines start from here: In the first, thousand dragons destroy most of the world and a few humans survive, living a miserable life. In the second, dragons also destroy a lot of the world, but more humans survive. However, the world is ruled by the strongest dragon of them all, Acnologia, and a certain evil human (Rogue) who can control dragons. In the third, the gate is closed before more than seven dragons can get through. These dragons come close to the killing a lot of people and causing destruction, but are fortunately forced to return to the past before any actual tragedy can happen, and the happy ending is earned. Acnologia, on the other hand, never vanished with the others because he's the only one who's lived through the past and all the way to the present, having been the human-turned-dragon who slaughtered many of them himself. He's spent the last few centuries flying around the world, occasionally wrecking stuff on the way and searching for any remaining dragons or the occasional strong human to fight and kill. Unfortunately, he's become a lot more active likely due to Zeref ending his self-imposed exile. In the Tartaros arc, the five Dragon parents of the 1st and 3rd generation Dragon Slayers return all of a sudden to stop the superweapon Face from activating and draining the world of all magic. Natsu's dad Igneel gets into a fight with Acnologia and dies, and the remaining dragons reveal that they've been dead for some time thanks to Acnologia reaping their souls, only surviving thanks to their remaining power and sealing themselves inside their children to prevent them from becoming omnicidal dragons like Acnologia. The original plan was to unseal themselves once the process was done and face Acnologia alongside their children, but Face forced them to act early and the weakened Igneel chose to fight Acnologia to both buy them time and get a shot at revenge himself. The dragons fade away afterwards giving parting words to their children. Magic: The Gathering: The Tarkir block is based around this idea, chronicling the plane's dragons returning, overthrowing the clans that had ruled the plane and conquering it for themselves. There's a twist though — the dragons truly are extinct, and it takes time travel (in a franchise where time travel is no trivial matter) to bring them back. In Dragonheart: A New Beginning, the dragons are extinct since the last movie but then some monks find a dragon egg that hatches. In Reign of Fire, dragons come back from extinction in the modern day and begin causing all kinds of chaos and havoc. A Song of Ice and Fire: Dragons have been functionally extinct for hundreds of years as of the beginning of the series, but at the end of the first book Daenerys Targaryen hatches three apparently-fossilized dragon eggs, gaining her the title "Mother of Dragons". They are accompanied by a distinctive comet in the sky and either cause or are symptomatic of (the TV show strongly implies the former) The Magic Coming Back in the setting. As hatchlings, they are a curiosity and a MacGuffin. Full-grown, they could be vastly powerful engines of war (the better part of a continent was conquered by Daenerys's ancestor, three dragons, and little else), but they also don't exactly come with an owner's manual, making them nearly as dangerous to their allies as their enemies. Cygnet: In The Cygnet and the Firebird, both the mage Rad Ilex and the villain Draken Saphier are attempting to invoke this trope and release the ancient dragons of their homeland Saphier from the Pocket Dimensions in which they have hidden themselves away. At the end of the book, Draken manages it, and drags dozens of dragons into existence hoping to swell his army. In the Deltora Quest series, the plot of the third set of books revolves around awakening the last of Deltora's questions who went to slumber because their kind was getting killed of by the Shadow Lord to destroy the Four Sisters which were planted by the Shadow Lord. Discworld: In Guards! Guards!, the Draco nobilis is believed to be extinct... until someone summons one right into Ankh-Morpork. It then proceeds to take over the city by fear and fire breathing. Dragonriders of Pern: Almost happens in the original trilogy. The dragon population had shrunk to a (probably unsustainable) size where they couldn't protect humanity from the Thread, so the protagonists have to find a way to bring back hundreds more. Lessa does it via Time Travel, incidentally causing the original population decline by brining most of the dragons from a few centuries ago into the present. In The Dragons Of Noor by Janet Lee Carey, this is pretty much the main plot. In Robert Reed's short story The Dragons of Summer Gulch, dragons went extinct thousands of years ago and all that is left are their fossilized and preserved bodies, which are extremely prized as their organs are a source of great medical interest. Local legend tells that the dragons will rise up and resume their rule of the earth, with only those that support them being spared. A treasure hunter uncovers eight live dragon eggs in the preserved body of an adult, which he intends to raise. The Elric Saga: Dragons tend to spend almost all of their time sleeping (they have to, so as to recharge their energies, as in 1 day requires something like 10 years of sleep), only coming out of their caves during extreme crises. Heralds of Valdemar: Not dragons, but no one living has ever seen a gryphon in the present of the series, although most cultures have legends or accounts of them being a friendly species. A mated pair showing up as advance scouts/diplomats, then, is a great shock to everyone. The Immortals: Inverted. All sorts of magical species return from exile in the Divine Realms where human mages had locked them centuries ago, except the dragons. Needless to say, the impact of the return is comparable with if not bigger than in other examples. Inheritance Cycle: At the beginning of the story, it's generally thought that dragons are extinct, other than King Galbatorix's enormous and menacing black dragon Shruikan, and perhaps any dragons that may live across the sea, far from where the events of the story take place. But the protagonist happens to accidentally steal and hatch the one dragon egg left. (Though you later find out that there was little accidental about it — the Eldunari (consciousness) of the hidden dragons altered the flow of magic to send the egg to him.) Then later it turns out that the evil emperor also has a dragon, and the king had two eggs left over, and both eventually hatched. In the final book, it was revealed that there was a whole cache of secret dragon eggs, which were re-claimed once Galbatorix was defeated. Kharkanas Trilogy: At the end of the first book, Forge of Darkness, the portal to Starvald Demelain, the first realm, is opened and the Eleint (also known as dragons), rumored to be creatures of myth, come flying in. Since they are creatures of Chaos, this is very bad news, although the exact consequences are relegated to the second book. Realm of the Elderlings: All the component series revolve to a greater or lesser extent around the return of dragons and their Elderling servants. The Fool in particular works towards this happening, claiming that the dragons will serve as a counterpoint to human arrogance and thus prevent the humans from destroying themselves. It is a long and arduous process, as the dragons' reproduction cycle is dependant on many factors and only one male and female dragon respectively are left. Seraphina: Played with. After humans moved south and the herds died off, dragons retreated to mountains and declined in numbers due to reduced resources. This all happened around two thousand years before Seraphina, and at an unspecified point in the interval the dragons returned and war was waged. After the peace treaty dragons return in saarantrai, mainly to study. In Wrong Time For The Dragons by Sergey Lukyanenko and Nick Perumov, the last dragons (who also double as Royal Blood) of a parallel universe have been exterminated a few decades ago, but now several factions are trying to bring them back. Specifically, the main conflict comes from the fact that the former Dragonslayer believes that he made a grave mistake by ridding his world of the dragons, who protected the world from invasion from yet another parallel world. His opponents are more than happy to be rid of the tyrannical Winged Masters and believe that they can fight off invasions on their own. Even worse, the invaders are planning on creating a dragon of their own to lead the invasion. The former Dragonslayer wants to facilitate the rebirth of the Winged Masters to counter the Created Dragon, while his opponents summon a new Dragonslayer to kill both the reborn and the created dragons. The Kovenant song "Dragonstorms" off of their In Times Before the Light album involves dragons rising again to conquer for the night, bringing about The Night That Never Ends. The Dragonlance setting of Dungeons & Dragons. The events of the War of the Lance include the return of both Good and Evil dragons. Fireborn has this as the game's schtick. Once dragons ruled in an age of magic and generic D&D-esque fantasy. Then the magic and dragons vanished as a cataclysm reshaped the world. In the modern day, magic has begun to return, and dragons with it. Except that their souls have stayed around and reincarnated as humans all along. Guess what you get to play? GURPS Dragons, a whole book about handling almost the whole range of Dragon Tropes in the game, has a full sample campaign setting and some short example setting descriptions built around the idea of dragons returning to the game world. In the main scenario, dragons appear in 1878 for reasons no-one — including the dragons — understands. Between a few hundred and a few thousand dragons simply wake into existence with a knowledge of language, a strong self-preservation instinct and no idea what or where they might have been beforehand. These dragons can take human forms and live in secret to avoid the attention of humanity, and several conspiracies develop to expose or study the dragons or to keep them hidden — several of the latter run by the dragons themselves. Theories on their origins range from them having emerged from a magical hibernation to their being Tulpas manifested from humanity's collective thoughts, ghosts of ancient dinosaurs released from the mining of fossil fuels and demons clad in flesh. Secondary scenarios project the same basic premise into later epochs such as the 20s, World War II, the Cold War and the modern day. 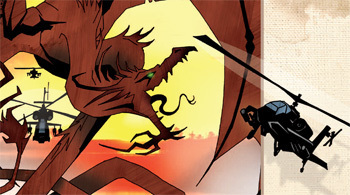 Story prompts include Pulp-style conflicts between lantern-jawed heroes and dragons seeking world conquest, spy stories against secret string-pulling draconic masterminds, and modern-day stories where the dragons have successfully gone underground behind layers of secrecy, obfuscation and historical revisionism to hide from human scrutiny. Another setting, while without actual dragons, describes a world where magic quietly vanished in the late middle ages, taking with it most of the totem spirits that had fueled magic beforehand. This lasts until the 90s, when a scholar stumbles upon a scroll describing the Dragon totem. This one appears to be the only totem left in existence, and its knowledge quickly spreads across the world to fuel a new age of dragon-powered magic. Shadowrun: One of the first signs in the setting's backstory that the sixth world had arrived and magic returned was when the dragons reappeared. The first was the Great Dragon Ryumyo, seen by 250 people aboard a Japanese bullet train. In Warhammer, the dragons of Caledor who fought alongside the High Elves started falling asleep about 3,000 years before the End Times, and then started waking up again as the End Times approached. 7th Dragon and its sequel 7th Dragon 2020: Dragons appear and wage war against humanity. It doesn't help that the dragons cause the world ecosystem to shift to their liking, which is deadly for humans. In Dark Souls, the ancient Everlasting Dragons with stone scales were supposedly "no more" once the Age of Fire began (excluding Seathe, who is scaleless). However it is clear many of them survive until the present time, some as unchanging as ever (the Stone Dragon on the Ash Lake) while others descended from them and mutated to a greater or lesser degree, becoming wyverns, drakes and basilisks. It is also shown that through a Covenant with the dragons, lesser beings can even mutate into a type of dragons themselves, such as man-serpents. The archdragons even breed with other races, as seen with Priscilla the dragon half-breed. Dark Souls II has the Ancient Dragon, said to be another one of the Everlasting Dragons, who seems intent on restoring its species in Drangleic. However, numerous evidences, like how it drops a Giant's Soul and Nashandra describing it as a "false idol", indicate the Ancient Dragon is actually an artificial creature constructed by Aldia. Another also appears in Crown of the Sunken King Downloadable Content: Sinh the Slumbering Dragon resides in the depths of the sunken city of Shulva, and woe to anyone foolish enough to disturb his sleep. Unlike the Ancient Dragon, there doesn't seem to be any doubt that Sinh is an Everlasting Dragon. Word of God also states the Everlasting Dragons are part "force of nature", so it may be that they can never truly be killed, and will always come back in some form. Dark Souls III curiously shows a few dead stone dragons at various locations in addition to dragon descendants from the previous games. Another Everlasting Dragon is also introduced in the Ringed City Downloadable Content, Darkeater Midir. The archdragon was raised by the gods, tasked to eternally battle against the creatures of the Abyss. However despite its immortality, Midir too is slowly being corrupted by it, which is why the protagonist is tasked to kill him before he completely succumbs to the Abyss and turns against his allies. The Dragon Age series takes it name from the current in-universe age, named thus because dragons, believed extinct for centuries in the setting, suddenly began appearing sporadically. Their return is taken as an omen of violence and upheaval in the new age—and, indeed, the first few decades of it were marked by a Blight (unseen in centuries) and the collapse of centuries-old Circle of Magi system, leading to a civil war. Oddly, the only form of Dragon thought to have been gone for good is the High Dragon, the eldest of their female metamorphoses. The smaller ones were known to still exist, and in fact the protagonists butcher dozens of them to no consequence. Furthermore, the supplemental comic The Silent Grove hints at an underground refuge for dragons, waiting to come back. In Dragon's Dogma, the Dragon's return causes Gransys to be overrun with monsters, symbolizing a period of strife after the long peace that the world has enjoyed for generations. With that, it's up to an Arisen to fulfill their destiny and face the dragon. That or make a deal with him so that he'll bugger off for a while and leave you an immortal, in the case of Edmun Dragonbane. Drakan: The Ancients' Gates sees Rynn and Arokh bringing back the dragons Trapped in Another World in order to re-establish the ancient Order of the Flame, pushing back the forces of evil that have almost subjugated humanity in the meanwhile. In The Elder Scrolls series, dragons were thought to have been rendered extinct in a concerted effort by the Akaviri Dragonguard and their successors, the Blades, in the late 1st Era. However, at the start of Skyrim, dragons return along with the return of Alduin, the draconic Beast of the Apocalypse who had been cast out of the stream of time thousands of years in the past by the ancient Nords using the power of an Elder Scroll. As it turns out, save for a few who went into deep hidingnote Mirmulnir is stated to be this in one of the in-game books, received protection from mortalsnote Nafaalilargus from The Elder Scrolls Adventures: Redguard, or bothnote Paarthurnax, leader of the Greybeards who resides on the tallest mountain in Tamriel, the dragons really were extinct, and Alduin is activating their inherent Resurrective Immortality to bring them back to life as his minions. The plot of Skyrim revolves around the return of the dragons and the Dragonborn being the only one who can stop them. Fire Emblem Elibe: The backstory has it that dragons and men used to live in peace, but then a war broke out 1000 years ago, and mankind sealed dragons away. In Eliwood's game, the plot eventually grows to the point where they have to stop Nergal from bringing dragons back into the world, because that would bring about another war between species that humanity isn't prepared for and, thus, the extinction of mankind. Guild Wars 2 has the dragons coming back in the 250 year gap from the first game and spawning an entire Fantasy Axis of Evil with their mere presence. In the response, the five major races have banded together and defeating them is the overarching plot of the game. Touhou: The backstory mentions the Great Dragon who helped create Gensokyo before departing for parts unknown; his return would be a sign that Gensokyo has gotten way out of hand. Iku Nagae is his messenger, who intervenes before things reach that point. Some fans speculate that the Brilliant, but Lazy gatekeeper Hong Meiling may be the Great Dragon in disguise, as her surname "Hong" refers to the rainbow dragon of Chinese mythology, and unusually for a Touhou character she has neither her species nor her unique power identified. The Inexplicable Adventures of Bob! : The dragons in the comic are Ultraterrestrials descended from Triassic lizards who really don't want anything to do with humanity after leaving Earth, but their attention gets drawn back here when scientists uncover a superweapon from the war that wiped out dragon civilization and killed off the dinosaurs.